The execution chamber at the Oklahoma State Penitentiary in McAlester. Oklahoma’s attorney general will now begin the process to set execution dates for three inmates after the U.S. Supreme Court today rejected the inmates’ challenge of the state’s use of a controversial drug in executions. The court ruled Monday that Oklahoma inmates failed to prove that the state’s use of midazolam, a sedative, as one of three drugs in carrying out the death penalty violated the Eighth Amendment’s prohibition against cruel and unusual punishment. The case arose in the wake of Oklahoma’s botched execution of Clayton Lockett in 2014, in which the convicted murderer writhed and moaned on the execution table and took 43 minutes to die. The high court’s 5-4 decision in Glossip v. Gross, as the case is known, means Oklahoma can continue to use midazolam in three-drug cocktail in executions. Justice Samuel Alito, writing for the court’s majority, said the inmates failed to identify any viable alternatives to midazolam, and that the lower courts did not commit an error when they ruled that midazolam was highly likely to provide for a painless execution. Oklahoma Attorney General Scott Pruitt lauded the ruling. Pruitt said his office will notify the Oklahoma Court of Criminal Appeals that execution dates can now be set plaintiffs in the case – Richard Glossip, John Marion Grant and Benjamin Robert Cole. Corrections Director Robert Patton thanked Pruitt for handling the case. “We appreciate the work of the attorney general and the consideration of the court. We will be working with the attorney general, the governor and the Court of Criminal Appeals to go forward with the executions that were previously stayed,” Patton said. Governor Mary Fallin also thanked Pruitt. In Oklahoma’s execution protocol, midazolam is administered first to render the inmate unconscious, followed by a paralytic and then a drug that stops the heart. Meanwhile, a manufacturer of midazolam issued a letter in March condemning all states using the drug, including Oklahoma. It remains unclear how this will affect the availability of midazolam. The state began to use the drug, which is often used to treat seizures and insomnia as well as for medical sedation, after supplies of other sedatives the state had used for executions became scarce. The state inmates in the case argued that the efficacy of midazolam in executions had not been proven, and that other drugs that have been proven effective could be used. Following the Clayton Lockett execution, the state revised its execution protocol to increase the dose of midazolam administered by fivefold and executed an inmate without incident this year using the drug. Department of Corrections spokeswoman Terri Watkins would not say whether the state had returned its supply of midazolam to the manufacturer or how much of the drug the state currently has. She did say, however, that the state will be able to go forward with the executions of the three plaintiffs. Also this year, the state approved a new form of execution by nitrogen gas should lethal injection be ruled unconstitutional. State law also allows execution by firing squad. Justice Stephen Breyer, writing the principal dissent, questioned the constitutionality of the death penalty in general. In her dissent, Justice Sonya Sotomayor wrote that the availability of other drugs does not answer the principal question of whether the punishment could be considered cruel or unusual. Baich said he plans to continue his work against the death penalty. 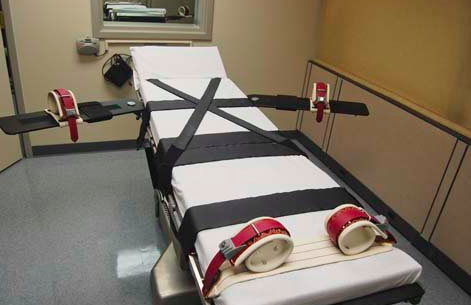 One issue, Baich said, is states argue that until an execution date has been set, no legal action challenging lethal injection drugs can be brought forward.